The best indoor gas heater is the one that fits your needs. To be the best indoor gas heater, it must be sized correctly for your space, be flued or an unflued (portable), and have the features you want possibly including remote control, thermostat, timer and safety features. The best indoor gas heater also needs to be the one with a price that gives you good value for money. Concerned that what your retailer recommends may not be the best choice for you or your home? Want to find the best price? The best LPG gas heater or the best natural gas heater all depend on what suits your needs. There are 4 major decisions to make when you choose a new gas heater. 1. Should you choose a Portable (Unflued) gas heater or a Flued heater? 2. You must also choose from the sub-groups, including radiant, convectors, radiant-convectors, power flued, flued radiant and wall heaters. 3. You need to determine what size heater you need for the size of the space you want to heat. 4. It is important to pick the correct gas type from either LPG or Natural Gas versions. All of these topics are covered in the following review. The types of gas heaters includes space heaters, portable heaters, convectors, radiant heaters and wall heaters. The sub-group types of gas heaters include radiant-convectors, power flued, gas wall furnaces and flued radiant. They have advantages over other types of heaters, including electric space heaters, wood fireplaces and heat pumps. Home gas space heaters provide heat to selected rooms of your home, as opposed to whole house ducted heating systems. Home gas space heaters come in different types of space heaters, including convectors, radiant-convectors, power flued and wall heaters. Gas space heaters are also an energy efficient way to heat your home. For gas heaters, gas input is expressed in Mj/hour. Heat output is measured in kW/hour. Generally speaking, greater gas input equals increased heat output, taking into account the relative energy efficiency ratings of the models being compared. Gas heaters in Australia are all tested and labelled for energy efficiency Star Ratings. Understanding what they mean can save you lots of money. The Star Rating is based on net heater efficiency. To be best portable gas heater it must also fit your needs. In addition to capacity sizing and available features, weight and physical size must be considered, for ease of portability. Emission levels can also vary, with some models having about ½ the permissable amounts. Portable heaters are very energy efficient. The typical Star Ratings for a portable gas heater is 5.8 or 5.9 Stars, meaning that they are about 90% efficient in converting the gas to usable heat. They require no installation, if you already have a bayonet fitting, and can be stored away when not in use. Unflued gas heaters do emit some combustion gases into your home, with the maximum levels specified by government safety regulations. Care should be taken if the family includes very young, unborn, elderly or individuals with some medical conditions, as they may be more sensitive to the emissions. They should not be used in sleeping rooms or very small rooms, like bathrooms. However, for the majority of people, they are quite safe when you follow all of the manufacturer’s safety instructions, including providing adequate ventilation. Radiant Heaters warm you much like the sun. Radiant heaters allow specific spaces within an indoor area to be heated, primarily warming only the people and objects positioned in front of the unit. They also come in smaller sizes for minor heating applications. The advantage of radiant heaters is that they are generally the lowest cost option and require no electrical connection. The disadvantages are an older style appearance and uneven heat distribution in the space being heated, with most of the warmth felt in the area directly in front of the heater. Radiant heater manufacturers include Rinnai and Paloma. Gas convector (Convection) heaters warm your space using convection or air movement. Along with the gas burner, they incorporate a fan to help distribute the heat more evenly throughout the space. Gas convectors are also sometimes referred to as Space Heaters. The advantage of convectors is that they also tend to have more advanced features like remote controls, timers, low emissions technology and electronic thermostatic controls, as well as a more contemporary appearance. The disadvantages are that convectors are a bit more expensive than radiant heaters and they do require an electrical connection to power the fan. Gas convector or space heater manufacturers include Rinnai, Braemar and Paloma. Radiant Convectors combine the two methods of heat distribution. They provide radiant heat to the area directly in front of the unit while distributing heat around the space using fan driven convection. The advantage is that you get spot heating as well as space heating. Pricing is in between radiant and convector models. The disadvantages include the need for an electrical connections, lack of some of the more advanced features and more traditional styling. Radiant convector manufacturers include Rinnai and Everdure. Gas fixed flued heaters offer the warmth of gas heating with no indoor combustion emissions. The term “fixed flued” refers to the fact that the combustion gases generated when the gas is burnt are directed out of your home by means of a fixed flue pipe through the wall or ceiling. Traditional gas fixed flued heaters have the flue pipe go straight up through your roof and are fixed in place. Powered flues give you many more design options, as the exhaust gas is fan forced horizontally or vertically, depending on the model. Additional possibilities include 90° bends and the allowable flue length may also be longer. This allows for wall outlets as well as roof exhausts. In addition, with a conventional gas heater, the air used for combustion is drawn from within the room. Flued heaters are also available in direct vent or balanced flue models draw the combustion air from outside your home, so there are less drafts and the fireplace is unaffected by closed doors, etc. The amount drawn in is balanced with the exhaust sent out. Flued heaters do cost more than portable heaters and must be installed by a gas fitter. Flued heaters are not as energy efficient as portable gas heaters and can have a broad range of performance, with Star Ratings from 1.0 to 4.8 Stars. Flued Radiant Heaters are radiant convectors that incorporate a flue for the combustion emissions. The advantage is that you get spot heating as well as space heating, with no indoor emissions. They are also sized to fit into existing fireplace opening or as a stand-alone console. 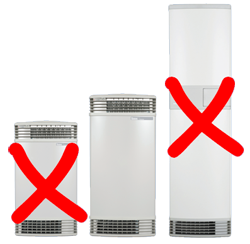 The disadvantage of flued radiant heaters is that they do not have power flues, so the installation options are a bit more limited. Gas fitter installation is also required. The styling is also a bit more dated. Rinnai is the major manufacturer of this type of heater. Power Flued Heaters are convection heaters with a power driven flue. The power flue provides more installation options. The advantage is that you get more evenly distributed space heating, with no indoor emissions. Styling is very contemporary and more advanced features like remote controls, timers, and electronic thermostatic controls are available. The disadvantage is that power flue models tend to be the most expensive option and all require installation by a gas fitter. Power flued heating manufacturers include Rinnai and Braemar. Wall Heaters or Wall Furnaces are a style of flued heater that is designed for an on-wall or in-wall installation. Adaptor kits are also available to fit them as replacements for old style wall furnaces. The advantage, as convection style heaters, is more evenly distributed heat. The ability to retro-fit into existing openings is also a big plus. The disadvantage is that wall furnaces can be a bit expensive and do require installation by a gas fitter. Best wall furnace manufacturers include Braemar. Gas Fireplace & Gas Log Fires are yet another form of flued gas heater. The best gas heater for large room is one with a high kW/hour rating, as that is the measure of heat output. The best gas heater for large room is not necessarily the one with the highest MJ rating, as MJ/hour is the measure of gas input. If you buy too small a heater, it will not be able to adequately heat the intended area. Selecting a heater that is too large will cost you extra money and oversizing can be unsafe. ♦ The volume of the area to be heated including consideration of ceiling height. ♦ The climate zone that you live in. ♦ The physical features of your home including wall & ceiling insulation, window coverings and carpeting. ♦ The kW output of the gas heater, not to be confused with the gas Mj input. You live in the Cold Zone and you want to heat an area 5m X 10m, which equals 50m². Same as the previous example but in this case your ceilings are over 2.4m and you have wood flooring instead of carpeting. You would need to deduct 5% for each of these two items. So, instead of 1 kW heating 10m², it would heat 9m² (10% total reduction). This means you would need a heater with 5.6 kW of output (50 ÷ 9). Megajoules per Hour (MJ/hr) ratings on appliances actually indicate the gas consumption of the appliance, not the heat output. It is often expressed as just MJ. Kilowatt Hour (kWh or just kW) is how gas heater output is measured. So, remember to use kW as a comparison and not MJ. The efficiency of the heater, in converting gas energy to heat, is a key factor. For example, a 25MJ heater with a 5.8 Star rating has an output of 6.2kW. A 25MJ heater with a 2.8 Star rating only has an output of 5.0kW. As a result, in a Cold Zone climate, they would heat 62m² and 50m², respectively. This means that the 5.8 Star heater will heat an area 24% larger while using the same amount of gas. Please refer to the manufacturers’ specifications to determine the exact kW output for each heater you are considering. Some States specifiy the minimum room sizing (volume of room in M³) and minimum ventilation requirements for unflued heaters. Minimum room sizing also varies between thermostatically controlled and manually controlled heaters. Portable heaters should not be used in bedrooms, bathrooms or hallways. All installations must comply with Australian Standard AS5601 - Gas Installations. To make it even easier, most manufacturers have sizing charts, for their heaters, based on climate zone maps. Take the time to measure the area you wish to heat and use these charts and maps to get the correctly sized heater. It is always wise to follow the manufacturers' advice.